Girl Guide Biscuits are more than just a tasty snack they’ve become an icon for Guiding throughout Australia. For 60 years Girl Guides, with the enthusiastic support of their families, have sold Girl Guide Biscuits to raise funds for their units and districts; to cover the costs of new equipment, camps, outings, adventures and learning programs. 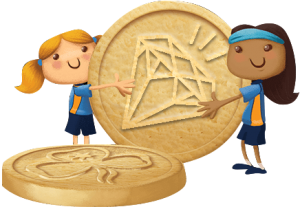 As well selling Girl Guide Biscuits helps girls have fun, develop valuable life skills and take part in making their communities a better place. The Girl Guide Biscuits have become such an important part of our organisation that it is essential that like Guiding, they continue to evolve to move with the times, modernize and respond to the changing tastes and expectations of our community. Following a comprehensive tender process, Girl Guides Australia developed a partnership with an Australian biscuit manufacturer. Our supplier, Modern Baking Company (MBC), is based in Melbourne, which means that the biscuits are sourced from a company that is both Australian-owned and locally based. GGA leaders around Australia have been working closely with MBC in developing this partnership which will deliver many additional benefits to GGA over the coming years. One of the major benefits to GGA is that MBC came to us with a comprehensive plan to grow sales of Girl Guides biscuits over the next several years, which will help us grow as an organisation and provide greater opportunities for our members. Our two organisations are working closely together developing the biscuits and developing new and exciting opportunities for girls as part of the biscuit campaign. We hope you are as excited as we are about the next evolution in Girl Guide Biscuits! If you have any questions please feel free to contact your state Girl Guide office.